Basic conversational phrases are something we can acquire through friends or family who speak another language, or even something we hear on TV. But what is there to offer those who aspire to be fluent? Duolingo is a language-learning app that provides extensive written and spoken lessons in more than 20 languages. Ranging from Spanish to Ukrainian, this app is ad-free, and more importantly free to all users. Launched on Nov. 30, 2011, this app prides itself in providing not only effective, but free language education. Duolingo was started in Pittsburgh by Professor Luis von Ahn of Carnegie Mellon University and his graduate student Severin Hacker. Von Ahn, born in Guatemala, and Hacker, born in Switzerland, believe that free education will change the world. Von Ahn saw how expensive it can be for people to learn English, and together with Hacker, was inspired to create a free platform for others to learn not only English, but several other languages spoken all over the world. Duolingo offers courses for English speakers to learn a foreign language, as well as courses taught in other languages for those whose native language is not English. Through the use of word translation and dictation, this app uses a gamified skill tree to track the user’s progress and to show how much of the course they have completed and how much remains. Each skill “leaf” on the skill tree focuses on a specific topic and consists of one to ten lessons that enhance understanding of that topic while expanding the user’s vocabulary. Users cannot go on to the next lesson in a skill until they have answered enough questions right to provide them with ten points. When completing a lesson, users can receive experience points, or “XP,” which shows how much of the course they have completed. Depending on how well they completed the lesson, users can gain lingots, the app’s currency, which they can later use to purchase bonus lessons or extra practices in a topic of their choice. 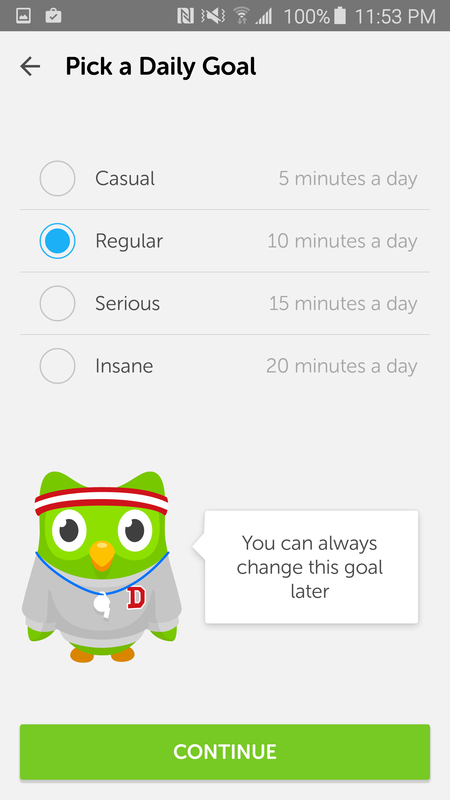 Duolingo is available for free on iOS, Android and Windows. With over 50 million downloads, this app has received an average of 4.7/5 stars from 2 million users. This app also reaches out to those without smartphones and tablets by providing the same in-app features online through their website. Users simply need to create a login and then select the course of their choice. The app, as well as the website, also provides the feature to take more than one course at the same time. Users can flip back and forth between courses, completing lessons at their leisure without sticking to just one language. I recently deleted all of my social media apps as a social experiment. Rather than obsessing over Facebook and Instagram posts, I wanted to spend more time focusing on what’s actually in front of me and not on my phone. In order to make the transition easier, I replaced my social media apps with news apps, giving me content to read if I was bored. I also decided I wanted to brush up on my French, and came across Duolingo. I was able to test-out of what I already knew and skipped ahead to new lessons. The app automatically sets a reminder for each day, indicating it is time for a daily lesson. I am happy to say I am now 7 percent fluent in French! Whether you want to perfect a language or completely learn another, Duolingo offers the opportunity to do just that, all without spending a dollar.